I have decided to give my high school English students more opportunity to create something with their hands–get them up and out of their seats and creating!! I’ve done some reading on makerspaces, and most of what I’ve found pertains to the STEM fields, and to elementary classrooms. I have found some promising leads though. I’m finding some relevant and interesting ideas from Angela Stockman. I’m currently reading Gamestorming and I’ve dogeared many pages of Intention: Critical Creativity in the Classroom. From what I gather so far, makerspace for ELA means letting the students create something first, and that creation inspires writing and additional reading and research. What I’m used to is having the students read a novel, for example, then assigning them a culminating project of some sort. I have no problem coming up with creative project ideas. I’m a self-taught artist, and I’ve always tried to incorporate the arts into my teaching, but makerspace seems to be a little different. 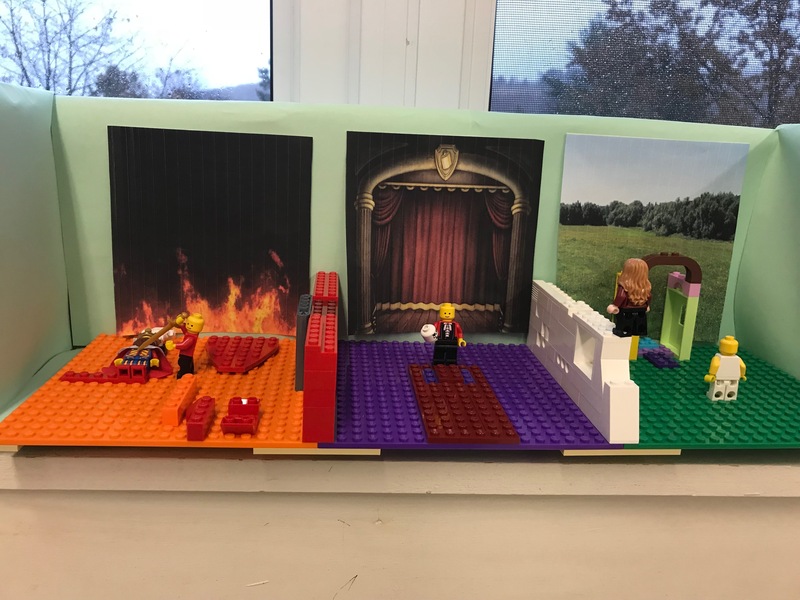 I’ve recently had my seniors create a hands-on project in response to Hamlet’s famous soliloquy. In year’s passed, I would have provided them with a few project choices, but this year I gave them loose guidelines and let them create. One of the first questions I got was, “Do you have any ideas for projects, Mrs. M. ?” I quickly answered, No. I provided them with plenty of supplies like glue, scrapbook paper, cloth, Legos, clay, paint, colored pencils, beads, and various arts and craft supplies. Before I let them start, I had them Pitch a Project Proposal. They had to explain to me how their project would pertain to at least 3 major ideas from the soliloquy. They had to sketch their project idea. I provided at least 4 classes for them to create their projects. Most of them started creating right away. After a couple of classes, the students reflected on their progress. I heard some students say, “I’ve never had to do something like this before.” Another student asked me how to get a glue stick out of the glue gun so he could put a new one in! He said he had never used a glue gun before! I was surprised. Our students are not working with their hands enough. I think we’ve done a great job at integrating technology in our classrooms, but we’ve forgotten that letting them use their hands to craft a project is just as important. It’s for this reason that I’ve decided to have my makerspace be low-tech. Don’t get me wrong, I like technology. It has its place. I have several social media sites; I used a plethora of software in the classroom everyday, but I think it’s important for students to exercise their creative thinking skills the old fashioned way–by getting their hands dirty! That’s not say that I won’t add a sprinkle of technology here and there, but for the most part, it’ll be cloth, paper, paint, glue, buttons, and cardboard! Next A Christmas Carol–Makerspace Style!